Saudi Arabia has two of the top five universities in the MENA region. Saudi Arabia tops the rankings for the best universities in the Arab World, with two of the three highest-placed institutions, according to data from the 2019 World University Rankings. The list, compiled by Times Higher Education (THE), filtered the overall rankings to find only those located in nations that are members of the Arab League. Saudi’s King Abdulaziz University comes top for the third year in a row, with Alfaisal University moving up into third place from seventh last year. 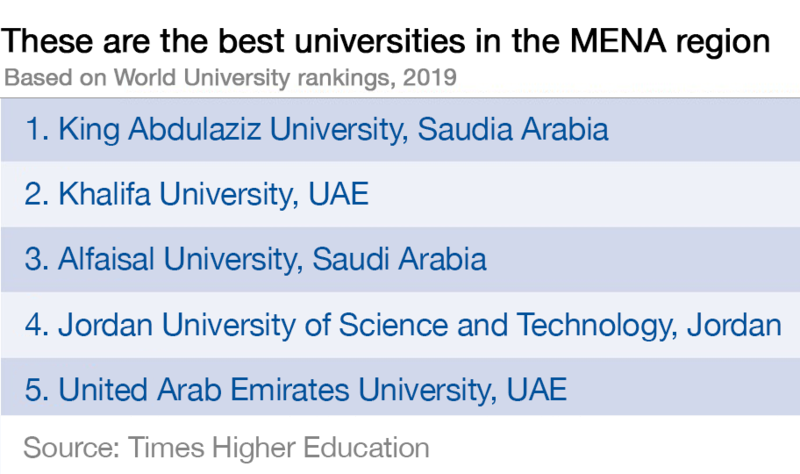 The United Arab Emirates also has two universities in the top five, both non-movers - and in fourth place is Jordan University of Science and Technology, meaning all five are based in the Middle East. To compile the World University Rankings, THE uses 13 performance indicators grouped into the following five areas: teaching (the learning environment); research (volume, income and reputation); citations (research influence); international outlook (staff, students and research); and industry income (knowledge transfer). Of the 52 in the MENA ranking, the most represented country is Egypt, with 19 universities. Algeria and Saudi Arabia are next with six institutions each; Jordan, Morocco and the UAE have four; Tunisia has three; and Lebanon has two. Many of the universities featured specialise in science and technology, which reflects much of the region’s ambitions to create a tech hub equal to Silicon Valley. “USTs in the MENA region are ideally placed, temperamentally and geographically, to take up this challenge,” says Tony F. Chan, President of King Abdullah University of Science and Technology (KAUST) and one of the Co-Chairs at the World Economic Forum on the Middle East and North Africa. One of the reasons Saudi Arabia tops the rankings is due to the funding it’s been pouring into research. KAUST, for example, which only has graduate students so is not eligible for this Arab World ranking, has an endowment of about US$10 billion despite only being set up in 2009. Named after the founder of Saudi Arabia, this university was established in 1967 in Jeddah on the banks of the Red Sea. Students receive free education and housing and it offers some courses that are unavailable elsewhere in Saudi Arabia, such as marine science, meteorology and astronomy. Located in Abu Dhabi, with another campus in Sharjah, Khalifa University was founded in 2007 by a decree issued by the president of the UAE. It has eight undergraduate engineering-based programmes and seven graduate degree programmes. It’s also planning to build a new campus in Abu Dhabi, with a medical school, state-of-the-art labs, a student hub and sports facilities. Established in 2002, Alfaisal University is a private nonprofit research institute, in Riyadh, Saudi Arabia. It has a mix of students - with 67% coming from Saudi Arabia and the rest from 40 other nations. Five colleges that make up the university: medicine, engineering, business, science and general studies and pharmacy. The campus of this state-supported university is located in northern Jordan and has 12 faculties ranging from medicine, to arts and sciences. It was founded in 1986 to train a local workforce, but now attracts international students from more than 60 countries. Founded in 1976, the United Arab Emirates University is the oldest university in the UAE. Students come from all seven emirates, plus 59 other countries, with international students making up a quarter of the entire student body. In the academic year 2016/17, male students represented 19% of the student population, to 81% female students. It has close ties to industry: 90% of undergraduate programmes include an internship and many students go on to have their first job with the organisation where they interned.